One night in 1874, a murderer crept into a New Braunfels home and killed twelve-year-old Emma Voelcker with an axe. The prime suspect was a family friend named Faust, lodging in the nearby Magnolia Hotel. A future governor prosecuted Faust, and an unknown assailant snuck past thirty-six armed guards to assassinate him. More than a century later, when Erin Wallace and her husband, Jim Ghedi, began restoring the hotel, first opened during the wild days of the Texas republic, they experienced eerie echoes from the past. One presence in particular cut through the chaos of slammed doors and roaming shadows to guide them to the Magnolia's darkest mystery. Wading through trial transcripts, newspaper archives and messages from disturbed ghosts, they discovered a secret history of Emma's death, a possible cover-up and its continuing legacy. Erin O. Wallace is married to her high school sweetheart, James “Jimmy” William Ghedi. Erin is a fifth-generation Texan born in San Antonio. She is deeply proud of being a descendant of the famous Texas Ranger William Alexander Anderson “Big Foot” Wallace and Nicolas Zuercher, one of the founding families of New Braunfels. She attended MacArthur High School in San Antonio before her family transferred to Louisiana. She spent many years in St. Tammany Parish, where she raised her two children, Jennifer and Michael. With her deep passion for history and genealogy, she became a local historian, a museum curator, a journalist, a history editor, a published author and an award-winning syndicated genealogical columnist. Her love of history and genealogy was always her first choice of conversation, but speaking of the mysteries of hauntings was never far behind. Being born to a parent with extreme psychic abilities, the supernatural was impossible for her to avoid. Throughout her upbringing, she was involved in her mother’s paranormal accounts on a daily basis, making her comfortable around the spirit world. Erin did not acquire her mother’s psychic capabilities, but she was blessed with the ability as a medium. 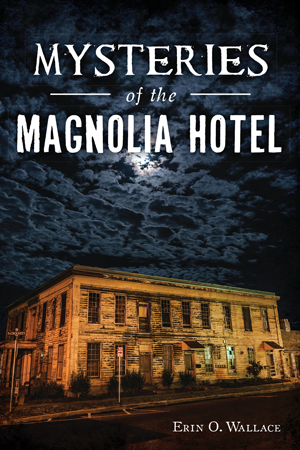 It is this gift and her love for the Magnolia Hotel for which the spirits have entrusted her with their deepest, darkest secrets.